January is a time of setting intentions and resolutions. It’s easy to think of objectives, but often difficult to follow through. Here is a step-by-step guide to writing goals you can plan for and complete. Take a moment to jot down an intention or two for 2017. It is important to use positive language. Rather than writing “stop sitting on the couch all evening”, write “walk the dog after work”. This will help you focus on what feels good rather than create the environment for negative self-talk. After you’ve come up with an idea or two, read along to turn those ideas into SMART goals. Goals need to answer the questions WHAT, WHY, and HOW. What would you like to do? Why is this important to you? How are you going to do it? SMART goal: Ride my bike frequently to improve cardiovascular health by joining my local bike store’s cycling club. Make it count! Establish specific, measurable goals so that you can monitor your progress. If you can see change, you’re more likely to stick with it. You may need to make short-term goals to work toward your long-term goal. In this case, Working up from riding 15 miles per week to longer distances of cycling will allow you track progress. This should answer the question “How do I know when it is accomplished?”. SMART goal: Ride bike 100 miles per week for 6 weeks to improve cardiovascular health by joining my local bike store’s cycling club. Make sure your goals are within your reach. This doesn’t mean “easy”. If you don’t have to work for it, you won’t get the feeling of achievement you’re looking for. Goals need to stretch you to initiate change. But if you’ve never ridden a road bike before, setting a goal to ride across the country is probably not going to be met. By setting yourself up for success, you’re more likely to stick with the plan. By making sure your goals is realistic, you need to answer the following questions: Do you have the resources you need? Is this goal relevant to you? Will this goal get your closer to your main objective? Regarding our cycling goal, to make it realistic we need a bike, to make sure that you enjoy riding that bike, and that this amount of riding will ultimately matter in improving your cardiovascular health. Making a deadline can give your goal urgency so that you start now rather than sometime in the future. SMART goal: Join my local bike store’s cycling club and ride bike 100 miles per week for 6 weeks to improve cardiovascular health by the end of June. 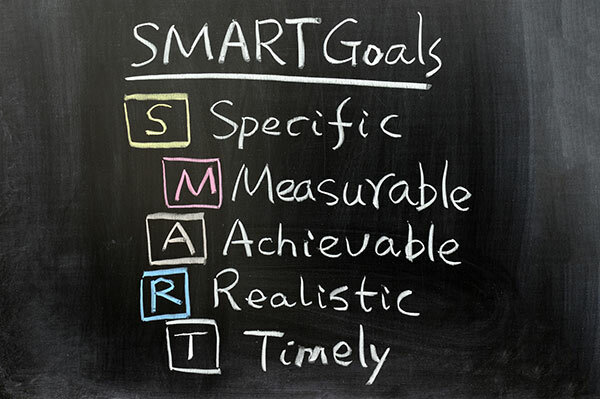 Once you’ve created your SMART goal, it can be helpful to reflect on what could stop you from reaching it. Set a timer for 5 minutes and write down all possible barriers to completing your goal, no matter how ridiculous they might sound. When the timer goes off, look at what you’ve written and then make a plan for combatting each one. Barrier: I live in Seattle and it rains too much to bike right now. Plan: I will buy a trainer to set my bike up on when the weather isn’t good for cycling. If you have a goal that is exercise-related, check out Erik’s blog post “Please, just keep a training log” for further training tips!